The respiratory system comprises the upper and lower airways, the lung tissue, and the vasculature supplying them. Asthma and Chronic obstructive pulmonary disease (COPD) represent two key respiratory disorders. Asthma is a chronic lung disease, characterized by inflammation and resulting narrowing of the airways. Asthma affects people of all ages, but often starts in childhood. An estimated 300 million people worldwide suffer with asthma. COPD is a chronic, slowly progressive, and only partly reversible airflow obstruction. Smoking is the primary cause. 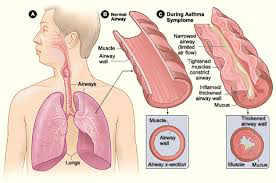 COPD usually involves two related diseases (1) chronic bronchitis (irreversible inflammation of the mucous membranes) and (2) emphysema (destruction of the lung tissue).